Over the Golden Globe weekend, awards movies are scoring big as they expand to more theaters ahead of Oscar nominations. Holiday momentum boosted “The Post” (20th Century Fox) as it expanded over the Golden Globes weekend ahead of its national release next week — the best platform expansion in over a year. “I, Tonya” (Neon) also generated a strong response as holdovers “Molly’s Game” (STX) and “Darkest Hour” (Focus Features) went wider to place in the Top Ten. Longer-running “The Shape of Water” (Fox Searchlight) and “Lady Bird” (A24) are still attracting large crowds. Strong word of mouth is pushing both established titles and fresh players to thrive against other wide release films drawing adult and upscale audience attention. Apart from this revival of interest in specialized film titles, what stands out is the way distributors placed their films for maximum impact against intense peak holiday competition. Their need is to keep the films vital through the looming January 23 Oscar nominations. Most of the awards contenders have been maximized, with few notable stumbles. This Israeli drama about the budding feminist movement among Palestinians nabbed by far the best reviews of the week’s limited releases. (It was the only one to report grosses.) This opened at two Landmark locations in Manhattan (the new theater on the Upper West Side will pick up demand after the closure of the Lincoln Plaza). These are minor grosses, but set up the film for national attention at niche locations. What comes next: A national big market roll out expected to hit most major cities starts this month. STX’s strategy of limited specialized initial play starting Christmas Day followed by a big national release on a slow week for new films has paid off with a decent if not spectacular second week. 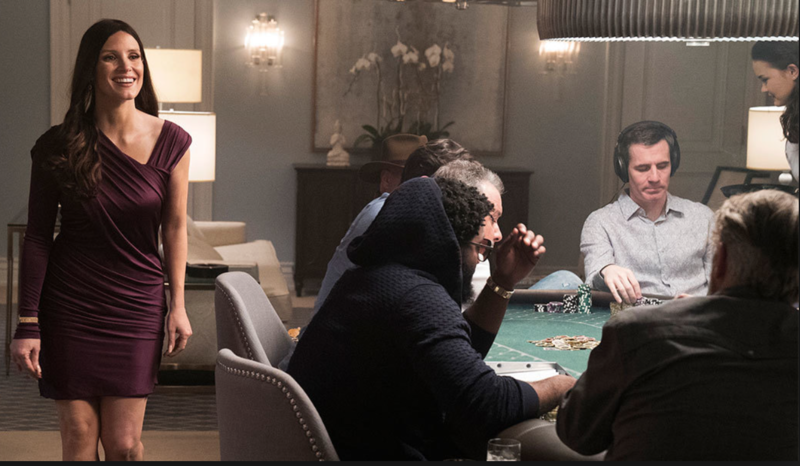 Aaron Sorkin’s true story about how an Olympic skier became a private gambling entrepreneur gets credit for breaking through to an audience already saturated with sophisticated releases. The ultimate test will be if the results (again, good not great) can sustain in weeks ahead, with Oscar attention including potential Best Actress and Best Adapted Screenplay nominations critical in this plan. But the timing of the release can only help its cause. Paul Thomas Anderson’s 1950s London fashion world drama added Toronto and a third New York date for its second weekend. The PTA remains healthy even if it falls behind the director’s prior films. This could be another of his niche films to struggle to gain mass appeal. It needs awards nominations ahead to give it a chance in further expansion in upcoming weeks. Annette Bening’s turn as actress Gloria Grahame late in life dropped about 30 per cent on its second weekend in limited New York/Los Angeles dates. That’s a fall from an already mediocre start despite major support from SPC. Fatih Akin’s German drama about a woman fighting back after right wing terrorists destroy her family had a small expansion in its second weekend but is still struggling to gain traction. All eyes are on whether this shortlisted foreign-language title lands an Oscar nomination. The near doubling of its theater count led to a 16 per cent increase in gross, providing Joe Wright’s film with another strong weekend. Focus has done a terrific job of timing the release, and a middle-American audience is responding well. Guillermo del Toro’s romantic fantasy continues to thrive, down only slightly after a strong holiday weekend and looking to add much more ahead. Searchlight has played this perfectly so far. A strong result for the first broadening of the Tonya Harding story. The theater average of some $10,000 is around the level of similar results for breakout successes like “Lady Bird” and “The Shape of Water.” Neon’s gamble of a slower release and timing their still wider exposure in January is working. We’re looking at an over $47,000 per theater average for the significant limited expansion of Steven Spielberg’s Pentagon Papers drama. That’s significantly bigger than either “Lady Bird” or “The Shape of Water” at a similar number of theaters early in their respective runs. As it breaks out wide next weekend, “The Post” will get a strong box office push alongside an expected awards crescendo that could reach wide popular interest. A small uptick in gross from the holiday weekend (with more theaters) builds on a strong total. Greta Gerwig’s comedy has now grossed far more than “Moonlight” in total last year, and is ahead of what recent Oscar winners “Spotlight,” “12 Years a Slave,” “Birdman” and “The Artist” each had taken in at this date in their runs. With a bounty of awards attention ahead, expect it to surge ahead of all those totals even if it doesn’t win. A big drop from last weekend as James Franco’s film looks like it has taken in most of its still impressive total prior to its potential awards attention. Though it has not yet shown the appeal of other rival recent releases, early in its slower release Luca Guadignano’s period gay romance is holding well in initial limited dates. With a wider release timed to parallel its expected significant Oscar nomination haul, it has already reached a significant gross in its early stages. Martin McDonagh’s black comedy is alive and kicking after a strong run. This could have plenty of steam left. With a theater total increase, the gross climbed a little from last weekend. Scott Cooper’s festival launched and initially platformed western with Christian Bale hit top markets this week in advance of its national expansion this week with a performance a bit better than its initial two city holiday dates. It still faces a struggle to gain a foothold, but at least this weekend shows it has some life in it. The film that will not die still adds to its impressive totals, with a shot at an Oscar Animated Feature nomination just ahead. Sean Baker’s long-running acclaimed Orlando motel drama keeps its presence alive again in its fourth month with hopes for further attention still alive. This could pop up for more play ahead.